Recently, there has been a growth in deceptive, unethical and predatory publishing practices occurring online. As victims, academics and their institutions, often experience financial and reputational damage from unethical scholarly publishing. When the time comes to consider suitable scholarly publishing outlets for your research, we highly recommend undertaking due diligence to select quality sources. Becoming vigilant and regularly updating your knowledge of scholarly publishing outlets to assess their quality, is a means to avoid publishing traps and pitfalls. 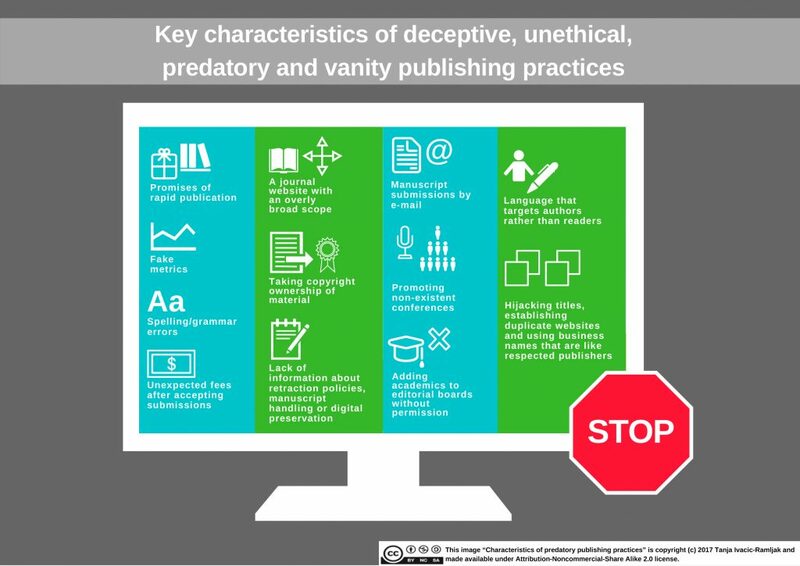 “Characteristics of predatory publishing practices” – original graphic by Tanja Ivacic-Ramljak (Liaison Librarian (Learning & Teaching), Veterinary & Agricultural Sciences). Click image for full screen. 23 Research Things blog provides a short summary of the current situation and precautions for early career academics regarding the avoidance of these publishing practices. Read the full post here or subscribe for frequent post delivered to your inbox. It is very nice that your blog is providing information regarding the program. I want to aware you towards the”GMR Transcription Academic Scholarship Program”. The program is open to all students who are currently enrolled full time in college and are maintaining a 3.0 GPA. Application Deadline is December 15th, 2017.